Bono (Paul David Hewson) is an Irish musician, singer and activist. Bono is the lead singer and main songwriter for the music group U2. His lyrics frequently refer to religious, political and social themes and, especially in the early days, were noted for their rebelliousness. 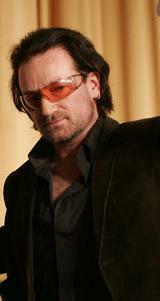 Bono is active in campaigning and supporting charities in Africa, such as Project Red and the ONE campaign. Bono says he was inspired to get involved in philanthropic work after taking part in the Secret Policeman’s balls in 1979. He is married to Alison Hewson (née Stewart) they have four children.